Kris, first born son, snuck into NZ 24 hours earlier and hid out at a friends so he could surprise me this morning. Michael, second born son organised brunch at Soul Bar and Bistro , one of my favourite places in Auckland. It is the best people watching spot in Auckland, the food is usually good and you may see the occasional celebrity to gossip about. At times the service seems a little slow and just when you are thinking I wish they would hurry up, the waitress appears, pencil in hand, to take your order....and right behind the waitress was Kris - surprise, surprise. My day was complete. 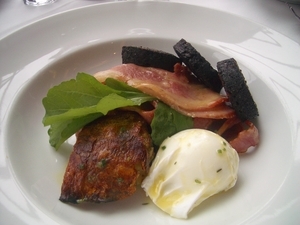 That's my meal in the photo - Bubble and squeak with grilled bacon, poached egg and black pudding. ...and very nice it was . We can also recommend the gnocchi, eggs Benedict and blue cod. To go with our coffee we shared the Soul cookies and chocolate plate.